This is the real deal, thot man pla, as taught in the Baan Thai Cooking School in Chiang Mai, Thailand. It is a quick and easy recipe, using any type of fish, prawns or crab meat. The fish needs to be skinned, filleted and boned then minced, so any humble fish will do, or a mixture. Great for those days when you catch a load of odds and ends and nothing big enough to look good on a plate. 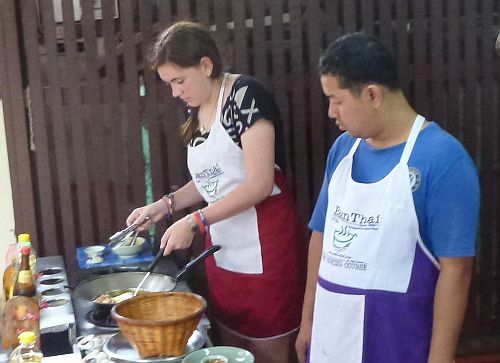 Above is daughter Aedy under the watchful eye of our tutor. Mix together everything except the palm oil. It will be a bit sloppy, but don’t worry just yet. Tip: kaffir lime leaves have a tough stem, to remove this simply fold in half length-ways with the stem uppermost, hold the leaf part in one hand and pull the stem up and away leaving the two halves of the leaf ready for slicing. Serve with a sweet chilli dipping sauce, bottled is fine but you could make your own. A squeeze of lime is good too.